Are you a travel agent or tour operator with a website? Do you want it on page one of Google? Fill in the free website review form at the top of the page and find out how we can help you. The Internet has changed few if any business sectors as dramatically as that of the travel and tourism industry. With more than 70% of flights and more than 50% of hotel rooms now booked online, an effective strategy of SEO for travel websites is a must to compete. 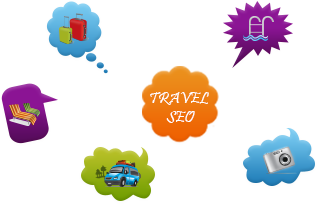 The travel industry is one of the biggest industries that dominate the online world. Gone are the days when one would need to go and present himself or herself at a ticketing office in order to make an airline reservation. Travel agencies have realized that it was a profitable decision to migrate most of their ticketing capabilities to servers that can reach potential clients at the client’s request. SEO for Travel Agents and Tour Operators is absolutely crucial if they plan on ensuring their website is seen by as many potential new clients as possible, an increase in web traffic from appearing at the top of Google for “Travel Agency” and “Tour Operator” related searches will usually lead to an increase in enquiries and business. At Kenovate Solutions we specialist in making business websites appear at the top of the search engines and have the expertise to help make your travel agents or tour operators website appear on the front page of the search results on Google, Yahoo and Bing, our SEO services for travel agents are low cost with no contracts and no set up fees. You can get a free proposal of your website. It also includes keyword research. What do you have to lose? Get found before your competitors. » Travel to Cairo - Specialist in Cairo Tours in Egypt. » Blue Mountains - Specialist for Blue Mountains adventure and New Zealand. Contact us today for your website promotion to start getting enquiries. Give us a call: +91-11-42141242 or click here to provide few information and we will call you back.